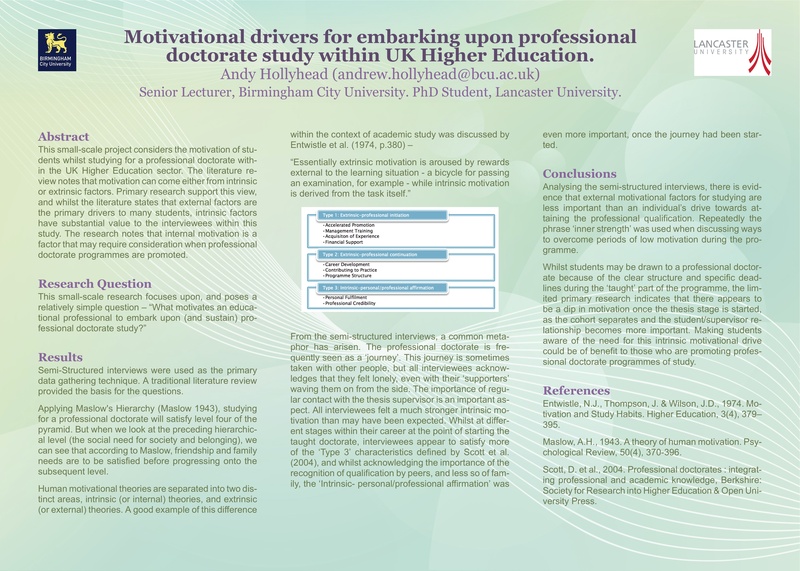 Last week I attended, and presented, my module two paper (and a poster based on my module one work) at the University’s Educational Research Conference. Whilst this was mostly ‘in house’ speakers, there was nonetheless a wide range of topics, and apart from some really appalling timekeeping for most of the sessions, was very useful practice. I did attend a talk from academics who were supporting the Online Educational Research Journal. This is a new type of open-access journal. The way it works is (fairly) simple. In agreeing to submit your paper to them, you agree to peer review three other papers on the site. Once this is complete, and your paper has in turn received three peer reviews, the anonymity of your own paper is removed, and others can then rate and comment on it, as well as download the paper. This all seems very noble, and as I had the paper that I presented at the educational conference to hand, I have submitted it to the journal here. You’ll see that there aren’t hundreds of papers there yet, and the quality does seem a little variable, let’s hope that mine ups the average ratings a little. I have two more papers that, if I was so inclined, I would be able to publish there, but I am waiting to see how quickly, and effectively this second paper is reviewed. If you’re looking for somewhere to publish a work that you can’t submit to a more formal journal, or present at a conference, this could be a good way to go.